France has criticised Poland's new law that makes it illegal to attribute Nazi crimes to the Polish state, describing it as an "ill-advised" move. "This law is ill advised, you should not rewrite history, it' s never a very good idea," Foreign Minister Jean-Yves Le Drian told BFM television. Asked if the EU would take measures in response to the controversial Holocaust law, signed into law by Poland's President Andrzej Duda yesterday, Mr Le Drian said he hoped "moral pressure will be sufficient." "I also hope that the Polish people will reconsider, and in the next elections act in a way that removes the unfortunate political straightjacket imposed by nationalist factions," he said. "Anything that could pervert this memory is negative," he said, saying the vote to bring in the law "should be condemned." The bill has drawn a chorus of criticism from countries including Israel and the United States. It sets fines or a maximum three-year jail term for anyone ascribing "responsibility or co-responsibility to the Polish nation or state for crimes committed by the German Third Reich - or other crimes against humanity and war crimes." 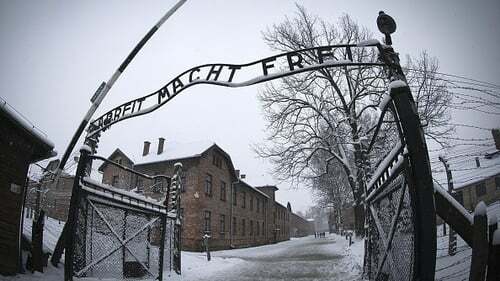 The main aim is to prevent people from erroneously describing Nazi German death camps such as Auschwitz-Birkenau as Polish, simply because they were set up on Polish soil. Israel has expressed deep concerns that the legislation could open the door to prosecuting Holocaust survivors for their testimony should it concern the involvement of individual Poles for allegedly killing or giving up Jews to the Germans. But Mr Duda and other Polish leaders say the law does not limit freedom of speech on Holocaust issues that are based in historical fact. Mr Duda also said he would send the legislation to the Constitutional Tribunal to rule on whether it conforms with guarantees for freedom of speech.